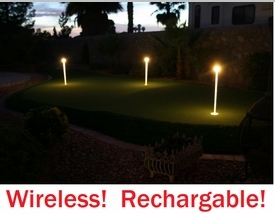 Wireless Rechargeable Putting Green Light FREE SHIPPING! Adding lights to your outdoor putting green used to be a big hassle and expense. It meant tearing up your green and running wires to an electrical source. Now Yardbright introduces the simple and INEXPENSIVE way to add value and enjoyment to your investment. The Yardbright putting green lights are ready out of the box and drop into any standard golf hole. Simply charge the Glow Ball that emits a bright LED light down the clear flagstick, not only illuminating the hole, but the area around the hole as well. 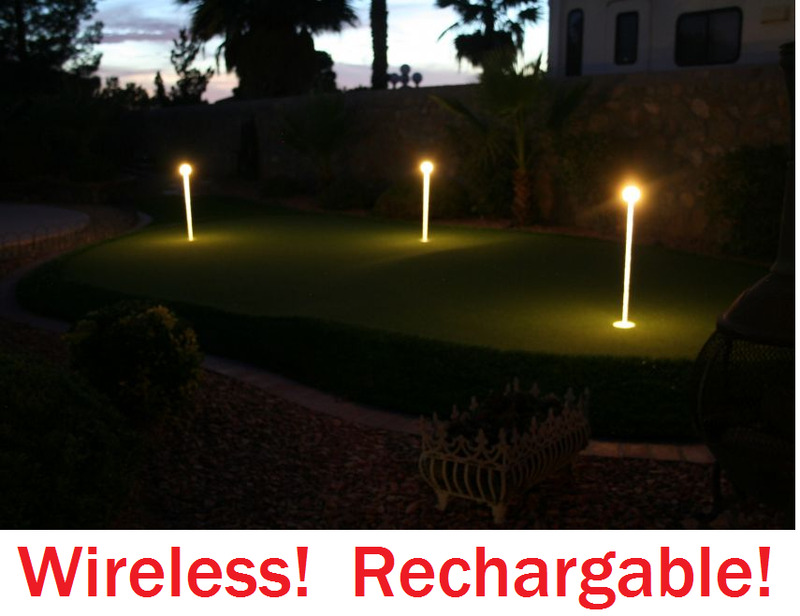 The charger is included, and once charged they will be lit for several hours, perfect for your a back yard putting party. These putting green lights are also perfect for golf courses that want to add fun and safety to their nighttime events (ask about special pricing for 9 or more). They not only light up the area around the hole to make putting at night much easier, but since they are 33" tall, you can also see them for approach shots and shots around the green.